What the heck is Windows Azure Pack formerly known as Windows Azure Services for Windows Server? That’s a very good question and I will try to show it in upcoming posts. This post should give you an introduction and an overview, basically a big picture. Microsoft has built, improved and enhanced Windows Azure over the past years to a massive, incredible amazing technology. All the lessons they have learned and technologies they developed are going to be provided in the Windows Azure Pack. We can say it will be the little brother of Windows Azure in your own datacenter providing the technologies already tested and proven to function. 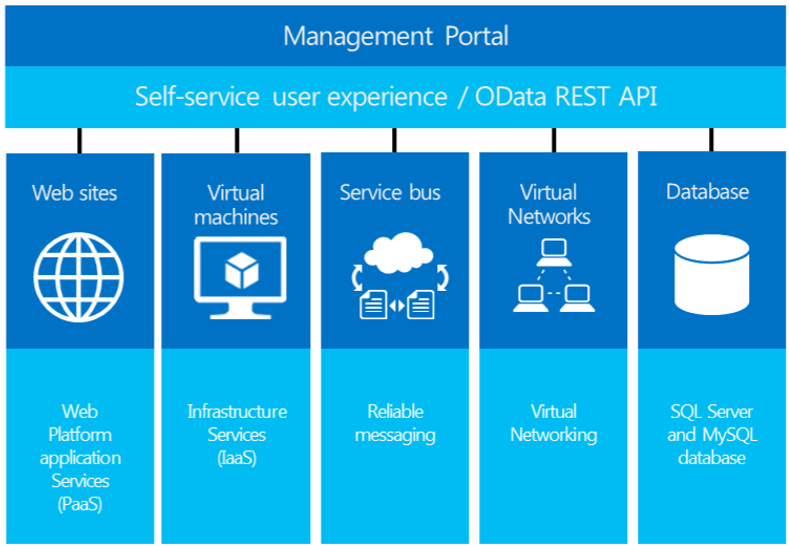 Don’t expect now, to have all the bells and whistles you have in Windows Azure to be available right now in Windows Azure Pack. This is even impossible for Microsoft in this first version of WAP. BUT in any case it is amazing what you get in this first shot of Windows Azure Pack. I assume you are familiar with the common cloud terms, if not, here a short wrap-up. On-Premises – Every piece of IT equipment that you manage and you are responsible for located locally in your datacenter. I would say it is IT 5 years ago. Infrastructure as a Service (IaaS) – In IaaS you manage the operating system and all layers on top of it. This means you don’t have to care about any layers below the operating system like hypervisor, hardware, storage, network etc. Platform as a Service (PaaS) – PaaS goes even a step further than IaaS and makes you life even easier so that you only have to care and manage the application and data itself. You don’t care at all about any layers below like middleware, operating systems, hardware etc. Software as a Service (SaaS) – SaaS is even the most comfortable solution because you don’t have to manage anything to run your application. You are basically just consuming and using the software e.g like Office 365. All these parts which you don’t manage, who is managing this? Well, glad you asked. This could be any service provider in your country or even Microsoft with its Windows Azure. A very clear and understandable picture I found was on TechNet. It shows clearly the separation of the responsibilities. At this point we have a basic understanding of these terms but there is an additional part that makes a cloud even a cloud. Elastic / Scalable – Imagine you sign a contract for IaaS and now you need additional resources like virtual machines in different sizes and compute power to expand your infrastructure immediately and at any time. Therefore your provider needs to offer a scalable or elastic solution to provide you this service. Usage-Based Chargeback – Now that you are able to order endless resources from your provider, the provider is interested in earning money by charging you the resources / compute power etc. you consume for your IT. So it makes sense to be able to measure, report and charge the provided service from a provider standpoint. Self-Service Provisioning – Whatever you are going to order from your provider you must have some sort of portal to place your demands so that you will get the right amount of virtual machines or services in the right size and power. For this to happen you need a self-service kind of possibility. Fully Automated – Because you are able to request any amount of computing power at any time for a certain amount of money in a self-service way it is somewhat logical that all this setting up and configuring behind the scenes has to be (fully) automated. Multitenancy – So far we talked only about you but there are other consumers of cloud services also. From a provider standpoint it is a must to provide / create multiple tenants while separating and/or combining the resources. So far we have discussed about what kind of service types there are and what properties they must fulfill. If we talk about cloud computing we usually don’t care where all my virtual machines and applications are running and my data is located. BUT if we are going to talk about setting up a cloud we sure care where our cloud itself is located. Finally there are 3 more terms we need to understand Public Cloud, Private Cloud and Hybrid Cloud. The Public Cloud model is probably THE cloud model most people are thinking of. Public Cloud provides shared services in different flavors we have discussed at the beginning (IaaS, PaaS, SaaS) which you can consume by connecting to the internet. A Private Cloud meets the same properties / services as the Public Cloud BUT it runs in your datacenter or in some cases at a providers datacenter. If you extend your Private Cloud services to the Public Cloud then you are going to have a Hybrid Cloud. Wow, now we have a basic idea what cloud means. There are plenty of sources out there which go much deeper on this topic and you will find out that we just touched the surface. Platform as a Service (PaaS), such as Web Sites and Virtual Machines. As I mentioned before Windows Azure Pack is a “Pack” of technologies which are meant to run in your own datacenter. Management portal for tenants – a customizable self-service portal for provisioning, monitoring, and managing services such as Web Site Clouds, Virtual Machine Clouds, and Service Bus Clouds. Management portal for administrators – a portal for administrators to configure and manage resource clouds, user accounts, and tenant offers, quotas, and pricing. Service management API – a REST API that helps enable a range of integration scenarios including custom portal and billing systems. Web Site Clouds – a service that helps provide a high-density, scalable shared web hosting platform for ASP.NET, PHP, and Node.js web applications. The Web Site Clouds service includes a customizable web application gallery of open source web applications and integration with source control systems for custom-developed web sites and applications. Virtual Machine Clouds – a service that provides infrastructure-as-a-service (IaaS) capabilities for Windows and Linux virtual machines. The Virtual Machine Clouds service includes a VM template gallery, scaling options, and virtual networking capabilities. Service Bus Clouds – a service that provides reliable messaging services between distributed applications. The Service Bus Clouds service includes queued and topic-based publish/subscribe capabilities. SQL and MySQL – services that provide database instances. These databases can be used in conjunction with the Web Sites service. Automation – the capability to automate and integrate additional custom services into the services framework, including a runbook editor and execution environment. 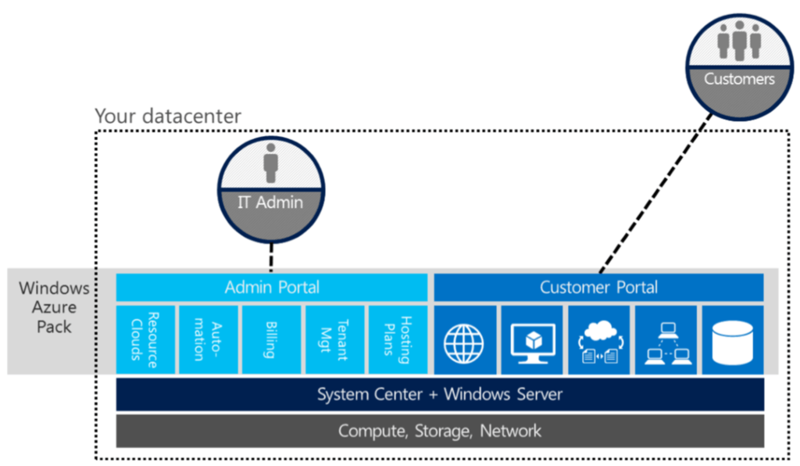 This post is an introduction what Windows Azure Pack is and where it fits into the cloud model. Keep in mind that WAP is pretty new and it is just the first version and I am sure we can expect more this year. There are definitely great blogs and articles out there here a few just to mention Marc van Eijk, Hans Vredevoort, Kristian Nese and of course my very good friend Thomas Maurer or the Windows Azure Pack Wiki on TechNet. If you are looking for a Whitepaper go to this Microsoft site. I hope this post helped you gaining a good understanding of this amazing technology.